Forming a team is a great way to enhance an already incredibly meaningful experience. Teams come in all sizes from 5 friends and family members to a group of 100 employees. Last year run for her had almost 300 teams and together raised almost $500,000 for run for her! Help us surpass that goal this year by getting your team started today! With the support of your team, training and fundraising is easier and multiplies the fun, laughter and your impact on the fight against ovarian cancer. The Team Captain plays a crucial role in team recruiting and fundraising. Here are a few suggestions to help build your team and fundraise with them. Distribute brochures to all family, friends, and co-workers. 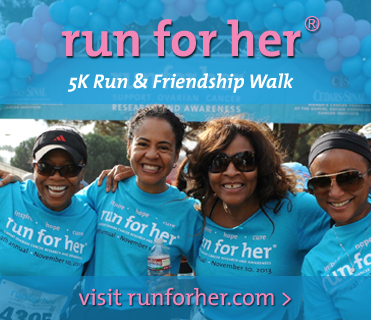 Promote the run for her® event with an article in your company newsletter. Ask your payroll department to insert event flyers with paychecks. E-mail all employees with the details on how they can get involved. Encourage online registration (remind team members to include team name when registering). Produce your own team T-shirt to wear at the event. If you are getting married or have a birthday coming up, consider asking your guests to make a donation to your team in lieu of a gift. Want to sleep in? Encourage your friends and family to register as a sleepwalker and be part of the Sleepwalkers Across America™. Have a “garage sale for her” or a “bake sale for her” let everyone know that proceeds will be donated to run for her® 5K run and friendship walk. Invite the run for her® Team Coordinator to speak at your place of business to encourage participation. Contact Marina Gudelman at (323) 866-6250 or Marina.Gudelman@cshs.org to schedule a time. Every step and every dollar is key to saving lives. Thank you all for your wonderful support! I am here to support you with anything you need so please don’t hesitate to contact me anytime at 323-866-6250 or marina.gudelman@cshs.org.